Now here’s where the arteries start to clog. In a pot, melt and 8 oz thing of cream cheese AND a bottle of ranch (or blue cheese if you prefer your wings with blue cheese). DON’T LET IT BURN, but melt it till it’s a liquid. Pour cream cheese and ranch on top of the chicken and hot sauce. Pour 2 cups shredded cheese on top. Bake at 350 for 30 minutes, or until the cheese has completed melted. Pull out and grab your favorite chips. I prefer tostidos scoops…helps you get the good stuff on there! So…happy cooking! If you have any go to recipes that you’d like to share, bring em on! Hi Amanda! 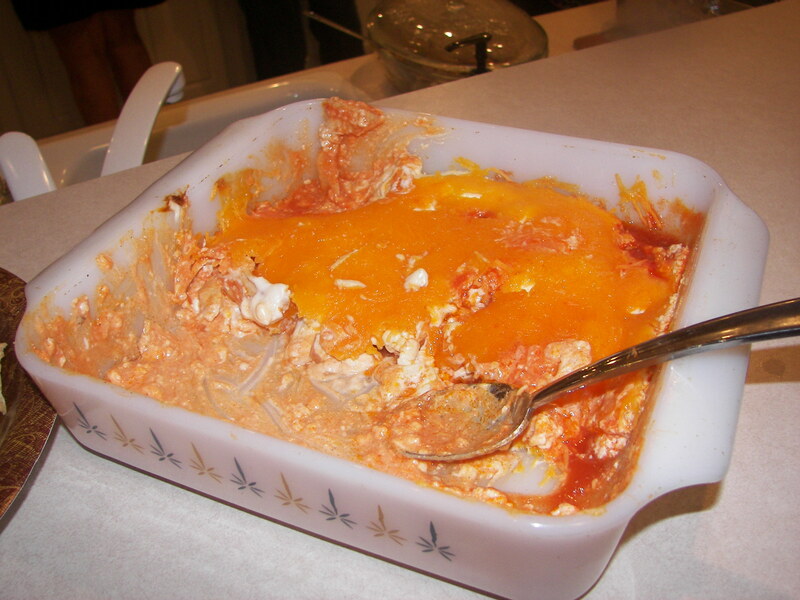 Mmmmm Buffalo Chicken Dip has been a huge hit at parties this year. You can also make it for a tailgate or cookout if you bake it before and then put it in a heavy disposable foil pan. Have you ever tried heating it on the grill to make it hot? It’s awesome. Also, we use canned all white meat Swanson chicken as it cuts down on the time and mess for sure! If you need to make this dip quick I highly recommend it. I work with Swanson so I know that it’s all breast meat and its low cal too!